From the other side of the Atlantic, they’ve built a wild base of fans, whose exuberant enthusiasm is rivalled perhaps only by the followers of Alex Ebert and his Edward Sharpe persona. And the comparisons between the two don’t end there: the same messianic messages are delivered with the same epic zeal in songs like Tiptoe (‘don’t let them know we’re coming’) and It’s Time (‘it’s time to begin, isn’t it?.. I’m never changing who I am’). Wherever they go, many will follow. A reverently riotous rendition of Blur’s ‘Song 2’ did nothing to harm their popularity either. There’s no doubting the power of a well played classic to further enthuse a following. Dan Reynolds performs with an appealing combination of self-assurane and modesty, but their true charm is in the obvious affinity between every member. The sense of collective is utterly infectious, but all this is built on some brilliant song-writing. From ultimate feel-good anthem I’m on Top of the Word to the brutally anthemic Radioactive, they’ve got winning tracks. But for all that is good, there is also frustration. The constant attempts at mysticism, from wolf howls echoing through smoke to someone’s best attempt at trippy lighting patters, turn from charming to annoying remarkably quickly. Perhaps it’s because whilst Imagine Dragons do their own brand of frenzied rock brilliantly, they begin to feel a little one-dimensional. Song after song drives the truly faithful into a frenzy but leaves the rest of us pining for variety. The beautifully harrowing Rocks soars over shimmering cymbals and squeaky clean base, admitting that ‘we fall apart’, but perhaps offering hope of a more eclectic future. A brief acoustic interlude, a conversation between guitar and violin accompanying an élégie for a passed friend, was extraordinary in all the right ways. But these are the exceptions that frustrate by their rarity. With more tours under the belt, more is sure to come. 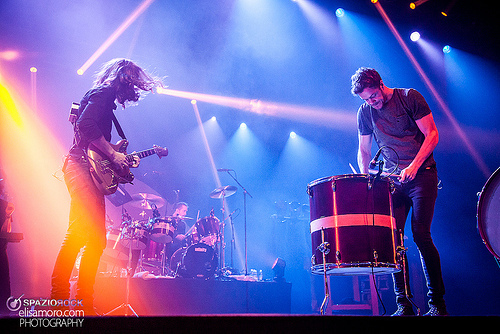 There’s no doubting how good Imagine Dragons are at doing what they do, so go and see them if you can. But if you don’t enjoy the first song, don’t bother warming the seat for too long. Instead, go away and come back later; give them time and they’ll be unstoppable. You can find Imagine Dragons on Facebook, Twitter or on their website.